32, 16 p. : ill. ; 20 cm. John F. Shaw and Co.
by Frances Maitland Savill ; with illustrations by Madelaine Irwin. Date of publication from author's inscription. Baldwin Library copy inscribed by the author. AUTHOR OF THE FLYING POSTMAN," SH.AG AND JACK,"
WITH ILL USTRA TIOVS B Y MADELAIINE IRWIN. May, that can't be my pretty little merry pet. 6 MA Y' S DREAM. unmistakably that they shared nurse's opinion. bed, and presently fell fast asleep. L, : E f -A .
Ic_ ... -. ; .: . ,, -. .. / . ; ,' .. ; ..
the other children, and seemed to delight in mischief. who could not take their own part. they must all hate him." made it laugh and clap its little hands. face changed till it became as pretty as the baby's. .:. .. Y... .- . ..
"How could ,I think her plain ? thought May. How odd it all is!" e3'; ::i 1L'' :i: Xt ;iTiP-dFZC. and all chattering so merrily. be the same little girl ? approaching from a house which stood in the garden. heard the child say, No, mamma." mamma can bear to look at her." unconsciously quoting nurse. But May was wrong. and forgiven, her face shone with peace and beauty. ,!" '': ,./: ': ''' -':'7" .. .'": .... .
: . 5 ,,. ,.,,.
" There appeared looking in at th-e gate the face of the boy whose ugly appearance had so distressed May." 1 9.
trap and could'nt leave it to die." are the same boy who was so naughty this morning." May could scarcely take her eyes off her. which appeared a globe and some books. Lessons,"
every question, went down lower. was fair and lovely as before. work-you must lose your treat this afternoon." as well on the whole to remain in obscurity at present. rest, yet now and then looking unhappy and restless.
" I should think so, with that nose! thought May. 24 MA Y'S DRE _AM. impossible had not her nose at once become smaller. children, now equally pretty, were kissing each other. not experienced since she came into this new world. gradually increased to resentment. "At my own home,"
dared to do herself. That's right," she muttered. she goes to see her poor people ; she'll do her good." will put me in prison," cried the girl. can be now. Let me fetch your mistress." recognize her, and held out his little arms to go to her. given to them as a reward, I wonder ? " ~I "" .. .-. .. "" : 9 : ..
emboldened by the angel's gentle words and manner. they are very good, but oh, so ugly! " it is there, and God sees it in all its hideousness. Child, nothing is fair in his sight but what is good. arms round nurse's neck and kissed her. Ctbd TDbentures in tb1e Doft Countrp. 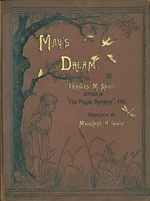 NUMEROUS COLOURED AND PLAIN ILLUSTRATIONS BY T. PYM. Small 4to. 5s. cloth extra. way so thoroughly excellent as this book. "-LITERARY WORLD. JOHN F. SHAW & CO., 48 PATERNOSTER ROW, F.C. Or, The Fair Maids of Taunton. By not her Own. vest; The Heroes of Barton School. By M.
EMILY SARAH HOLT. Crown 8vo, 8vo, cloth extra, 8s. 6d. Crown 8vo, cloth extra, 5s. extra, 8s. 6d. The Lyon's Den, and Only a Tramp. Lyons; tions. Crown 8vo, cloth extra, 8s. 6d. By YOTTY OSBORN, Author of "Jack,"
Home; Small 8vo, cloth extra, 2s. 6d. her." Crown 8vo, cloth extra, 5s. A Story of Barge Life. By C. PALMER. Gipsy Mike; 8vo, cloth extra, 2s. 6d. Or, Firm as a Rock. iWith Illustrations. Crown 8vo, cloth extra, 8s. 6d. cloth extra, 8s. 6d. cloth extra, Is. 6d. JOHN F. SHAW & CO., 48 PATERNOSTER ROW, E.C. Or, Georgie's Visit to Lotty. With Illustrations by T. PYM. Square cloth, 8s. 6d. one sure to satisfy any little girl to whom it may be given. "-A thenaeum. Lotty's Visit to Grandmama: A Saturday's Bairn. A Story for the Little Ones. With Crown 8vo, with Illustrations. 5s. "A very delightful story too. . We first page."-Echo. "An admirable book for little people. ... "An excellent and most interesting tale." We most cordially recommend parents and -Aunt 7udy's Magazine. -Literary World. Nothing to Nobody. Froggy's Little Brother. New Edition, small 8vo. Illustrated. Crown 8vo, cloth extra. 3s. 6d, 'Jessica's First Prayer' and 'Little Meg.'" Plenty of original merit: we wish to give -Record. own which makes it very pathetic and yet Both will find something to interest them." t ales of nglib ILife in tte @llen tifme. Illustration reduced by Phot graphy. Imogen. Isoult Barry of Wynscote. A Story of the Mission of Augustine. 5s. A Tale of Tudor Times. Es. the characteristics ot an eventful period of able. "-The Christian. Or, The Lamps of Earth and the Light A Tale of the Last Century. Ss. "We promise its readers a rare literary religious tale. "-English Independent. "An admirable story, full of life and Edition. Ss. The White Rose of Langley. written. "-Literary World. A Story of the Court of England in the Mistress Margery. "Olden Time. S. A Tale of the Lollards. 8s. 6d. Robin Tremayne. holy tears." --The Sword and the Trowel. A Tale of the Marian Persecution. 8s. "The book is extremely well written. "- The Well in the Desert. A thenaum. An Old Legend of the House ofArundel. racters are all well drawn. "-A theneum. story. "- Watchman. A Tale of the Days of Queen Mary. Small 8vo. Illustrated. Cloth. 2s. 6d. A work of thrilling interest."-Rock. "Capital stories for thoughtful young readers. "-Literary World. Or, The Polishing of the Pearl. Crown 8vo, Ss. A Tale of the Crusades. Crown 8vo, with Frontispiece, 5s. the authoress has preserved the spirit of the age. "-The Graphic. Or, None of Self, and All of Thee. A Tale of the Reign of Queen Anne. Crown 8vo. Jean Lindsay, the Vicar's Daughter. By EMILY BRODIE. With Illustrations Crown 8vo. 8s. 6d. The tale is admirably told."-Bookseller. Author of "Jean Lindsay," &c.
A Story with a Happy Ending. By A. T. WINTHROP. Crown bvo, 8s. 6d. Or, Every-Day Battles. By FIDELITA. New Edition, Crown 8vo, with Illustrations. Bs. "A clever combination of narrative and allegory. "-Churchmnan's Magazine. A Tale. By A. L. O. E. New Edition, with Illustrations. 8s. Sd. JOHN F. SHAW & CO. 48 PATERNOSTER ROW, E.C. Or, Young Workers for the King. By C. S. With Illustrations. Crown 8vo, 8s. 6d. A charming story. "-Evangelical magazine. 27'--': .... and Out of It. A Year of my Life-story. SIi AA Tale of Home Life. By the A4uthor of the "Spanish Brothers," Undter the Southern Crovs." A Story of Old Paris. Crown 8vo, cloth. 8s. 6d. A Tale of the Early Church. By F. EASTWOOD. Small post 8vo. 8s. 6d. impetus to faith, hope, and love. "-The Ckristian. Aunt Hester, and why we Loved Her. A Story of Rosebrook. Crown 8vo, cloth. 3s. 6d. This charmingly fresh and original story. "-Literary World. JOHN F. SHAW & CO., 48 PATERNOSTER ROW, E.C..
%torics bp L. C. L@eaSe. New Edition. Illustrated. 3s. 6d. Little Lad," page 21 . Scamp and 1. Your Brother and Mine. A Story of City Byeways. New Edition, A Cry from the Great City. Illustrated. with Illustrations, cloth extra. 3s. 6d. 2s. 6d. "The details of Lettie's devotion to her White Lilies. popular with elder readers as many of Illustrations. ls. 6d. are. "-Aunt 7udy's Magazine. beautiful character."-Rock. JOIN F. SHAW & CO., 48 PATERNOSTER ROW, E.C. popularr Cale0 bp L. C. Seabe. New Edition. Crown 8vo. 6s. Most interesting; we give it our hearty commendation. "-Englisk Independent. Crown 8vo, cloth. 3s. 6d. which underlie life amid the most sordid surroundings."-Athenaum. Told with much skill and tenderness."-Scotsman. A Tale. By L. T. MEADE. New Edition, crown 8vo. With Illustrations. 6s. The description of Dorothy's life is excellent."--Sfectator. Or, The Story of a Great Endeavour With Illustrations. Crown 8vo, cloth. 5s. will read it with eagerness and profit. "-The Churczman. The House in the Glen. And the Boys who Built it. New Edition. Illustrated. 8s. 6d. Exactly what boys like. "-The Guardian. SA Chapter in a Boy's Life. Or, Our Home in the Far West. BY J. HARRISON. BY GRACE STABBING. 88. od. New Edition. Illustrated. tions. Crown 8vo. 3s. 6d. si We can heartily recommend this story. Or, Boy Life and Boy Work. Illus- Brave Geordie. treated. 8s. 6d. Brave Geordie. and the whole teaching thoroughly whole- Illustrations. Crown 8vo. 8s. 6d. Paul Thurston and his Little The Earl-Printer. 88. od. C. M. M. With Illustrations. 2s. 6d. seller, please juvenile readers. "-Irislt Times. Or, The Corbet Chronicles. By L. E. GUERNSEY. Crown 8vo. Cloth. 3s. An unusually successful attempt to reproduce the manners of the seventeenth century. A, tOr, Dawnings of Light. An admirably told story of a brave little Puritan maiden. "-English Indelendent. A truly delightful story, drawn to the life. "-Leeds fIercury. Or, The Niche for me to Fill. 88. 6d. "This story has pleased us much. It may be very serviceable to a young girl, and will. certainly be read with pleasure. "-English Indefendent. With Illustrations. Cloth extra. 3s. 6d. A charming Christmas story. "-English Indelendent. I know!' cried Johnnie; 'you shall give the bread, and I'll keep watch for Richard. in the book.' "-See "Pickles," t. 52.
life, being alone worth the price of the book. "-The Baptist. Or, Oniy a Little Girl. By YOTTY OSBORN. Square, cloth, Ss. 6d. Or, Getting into Mischief. Small 8vo. Fully Illustrated. Cloth. 2s. 6d. Is perfect in its way for very little people. "-Evangelical Magazine. and misadventures of a brother and sister. "-Hand and Heart. Or, General Weissel's Grandchildren. By YVONNE. Cloth, 2s. 6d. long time read anything so bright and sparkling."-Guardian. IN ATTRACTIVE BINDINGS. GOOD TYPE. WELL ILLUSTRATED. Or, Chosen to be a Soldier. With Illustrations. Cloth. Is. 6d. Or, Crispin's Story. By Mrs.
Or, Lost and Found. Fcap. 8vo. O - Op A Story for all Little Fellows. STORIES BY M. L. C., AUTHOR OF STORIES BY F. F. G.
Or, The Heart's True Resting-place. Or, The Story of the Good Samaritan. "Clarie's Little Charge. Or, A Living Remembrance. Or, Willie the Orphan. Sunday School Teachers' Magazine. these stories. "-The Christian. Or, Following the Footprints. Or, Love and Duty. By C. M. Or, Little Mollie and her Brother. "An invaluable little book for the young." Tom Carter; Or, True Honour from God only. Charlie and Lucy; or, How Tom was Rescued. 1s. Od. Or, The Lonely Heart made Glad. We strongly recom-mend it as a gift-book Too pretty a book to be left unnoticed." for children. "- The Christian. -Guardian. A Story of Work. By MAGGIE SYMINGTON. Crown 8vo. 6s. ""r' tro] tIhe Soldiers of the Cross. ing and profitable. "-Christian Age. / Or, Only a Week. New Edition. S Small 8vo. Cloth. s. 6d. True to the End. The Old House on Briar Hill. Dr. EDERSHEIM. New Edition. Illus- Book. Illustrated. 3s. Sd. old favourite. "-The Rock. charming work. "-Christian World. most the skilful ease of the writer, or the Record. Tim's Little Mother. POLLARD, Author of "Nellie's Secret." By S. PUNOT. With Illustrations. Small 8vo. Illustrated. Cloth. 2s. 6d. A pleasant story that cannot fail to satisfy the little ones. "- Watchman. And Others in Neither. By OLIVE THORNE MILLER. With nearly 200 Illustrations. Handsomely bound in cloth, gilt edges. Price 7s. 6d. what is interesting to know about a few of the millions of creatures that live on our globe. about the ways of our little neighbours. "-Extractfrom Preface. many a collection of fairy tales. "-English Independent. Feathers and Fur." Fully Illustrated. 4to, cloth extra. 7s. 6d. "JOHN F. SHAW & CO., 48 PATERNOSTER ROW, E.C. ATTRACTIVELY BOUND, WITH ILLUSTRATIONS BY T. PYM. A book for every child's heart; it should be sold by thousands. "-Christian World. A capital story for children. "-Daily Review. OR, PUSSIE'S FROLICS IN FARM AND FIELD. The story is exceedingly diverting, and the pictures are admirably drawn."